Book/CD Pack by Ernie Sites Centerstream Publishing. 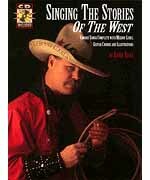 Contains great songs of the New and Old West in melody line/lyrics/guitar chord arrangements, poems, photos & illustrations, and fascinating facts and the background history of the West. Songs include: Whoopee Ki-Yi-Yo (Git Along Little Dogies) - The Old Chisholm Trail - Carry Me Back To The Lone Prairie - Home On The Range - Bad Brahma Bull - I'm Just A Little Cowpoke - more. CD includes Ernie Sites singing the songs and reciting the poems.